Instagram Message: I tend to waffle between savory and sweet food. Please check out Thoughtfulpinch.com - Waffle Day is 8/24. Whether it’s made of leavened batter or dough, the waffle falls under the same syrup-thirsty options such as pancakes, crepes and french toast. Although they may seem similar, there are different characteristics of each mouthwatering morning treat. I personally think that because it’s sturdy and the grid pattern holds it contents better than any of the others, the waffle has more functional presence in the food world. I mean, hello? We trust the waffle to hold scoops of ice cream. The waffle has come a long way and we should celebrate it! Research on the site nationaldaycalendar.com enlightened me with the history of Cornelius Swarthout of Troy, NY who was granted a patent for his waffle iron on August 24, 1869. Waffle Day is celebrated on that anniversary every year. Some other waffle history tidbits that I picked up on the site include: General Electric introduced the electric waffle iron in 1911, the frozen waffle Eggo became available for purchase in grocery stores in 1953 and during the 1964 World Fair in New York, the Belgian waffle made it’s debut. The question is: When it comes to waffles, do you waffle between savory or sweet toppings? Because I just learned when the Eggo was invented, it seemed natural for me to Google when Kraft American Cheese slices were invented. Those wrapped-in-plastic-cheese slices have been around since 1949. By the time I was able to eat waffles, the conveniences of a frozen waffle and plastic-wrapped cheese slices were not new to the world. What was probably new and probably NOT common was topping a toasted Eggo with a slice of Kraft cheese, cutting the waffle into bite size pieces and then dipping the pieces into Aunt Jemima syrup. When my dad first introduced this combo to me I remember thinking it was a crazy Filipino thing but when I took a bite, I was hooked! Convenient sweetness meet very convenient savory. The September 2017 issue of Food Network Magazine came with an insert F.N.M. Family which had recipes for some savory waffle recipes. 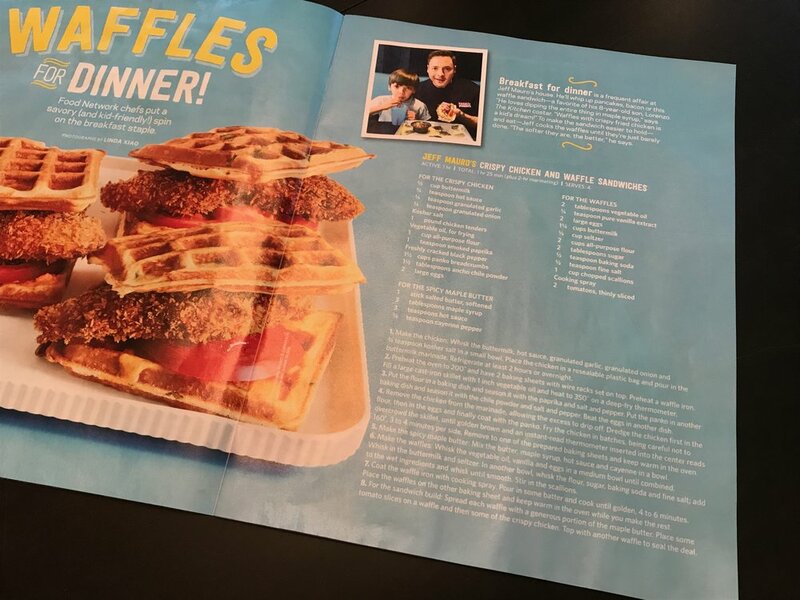 Besides the one above, Haylie Duff's Ham & Cheese Waffles and Kelsey Nixon's Cornbread-Cheddar Waffles with Scrambled Eggs are in the issue. When the kids and I went to Disney World our incentive of getting there when it opened was to enjoy breakfast at the Magic Kingdom. There we encountered our very first Nutella, strawberry waffle taco. It was so good that it’s still a favorite way to eat waffles on Waffle Wednesdays at my house. My amazing neighbor asked to borrow my waffle iron the other day because she was hosting a waffle bar for her law clerks. That’s normal, right? Every year her company hires summer law clerks. It’s a ten week, highly competitive program. They hire two aspiring second year law students for positions that are not high paying but rich with experiences. Instead of a “Last Day” lunch, my neighbor treated them to a waffle bar - yeast waffles with the opportunity to top them with homemade caramel sauce, homemade apple sauce and homemade strawberry syrup. In addition, syrup, chocolate chips and whipped cream were also available as toppings. The other colleagues brought homemade caramel rolls, fresh fruit and juice. All of this hoopla was to make sure that these law clerks knew how much they were appreciated. My neighbor uses food, specifically meals, to bring people together and I vouch that it works EVERY single time. There is no waffling when it comes to describing my neighbor. Her thoughtfulness unites people and her food is her pinch letting people know she appreciates and cares about them. Nowadays, the waffle is such a versatile food that it’s not just for breakfast anymore. Use the opportunity of Waffle Day to show some thoughtfulness. Game Changer snack. Love these. I always eat two because I can never just eat one.